View the top video marketing companies in the agency listings below. You can filter video marketers by their location, average hourly rate, experience, and team size. The best video marketing agencies help businesses conceptualize, produce and distribute valuable multimedia that will grow their brand. The types of videos that marketing companies create include content marketing videos, demos, how-to’s, social media videos, onboarding videos and more. This region is a beautiful place that has a lot of things to brag about. This area is well-known for its highly educated professionals and talented people. But due to the lack of opportunities to pursue a career in own town, a lot of young people and families leave this place towards the bigger cities. Our mission was to explain that this region is running empty and the government should take action as soon as possible to make this region a better place to live and work. Crystal Pyramid Productions has provided award-winning video production services out of San Diego since 1981. Our clients are top corporations, broadcast producers and nonprofit agencies from around the world who want the best, most experienced video crew and high-end broadcast equipment. We offer competitively-priced production packages with state-of-the-art broadcast-quality High Definition – 4K+ gear. See our extensive in-house list of high-quality video camera equipment (NEW Sony FS7 plus an Odyssey 7Q+ recorder/monitor), lighting, grip, sound and 17″ teleprompter. We offer discounts to nonprofits. For the Best in Creative Production Services, Quality Equipment, Expert Producers & Competitive Rates, Call Crystal Pyramid Productions. Come to Our Studio or We’ll bring our Studio to You – We are available 24/7 – Call (619) 644-3000. Are They Experts At Video Distribution & Promotional Platforms? The best video marketers in the world know what platforms to use and how to distribute quality, branded content in order to make the greatest impact. The understand the power of YouTube over other channels. They know how to promote certain videos to certain audiences. For instance, more than 500 hours of video are watched on Youtube every day. Top video marketers will know how to utilize these channels for peak promotional opportunities. What’s more, they intrinsically see the value in placing certain videos — based on type, length and content — on one medium or the next. Because video marketers have such strong expertise, they can advise brands on the platforms that will benefit them the most and create content that will perform well on those channels. More consumers want to see their favorite brands promoting video content — 54% in fact. In addition to taking your videos and blasting them across the internet as part of a larger marketing and brand awareness campaign, the best video producers and marketers also create additional collateral. Your branding needs to remain consistent. You want your audience to continue to trust in your brand and look to you as an authority. As a result, you need to use this video to promote your core values. Along the way, you need to create additional, branded content to support your overall campaign and the video itself. The best video marketers pride themselves on their ability to create branded content in the form of social media imagery, case studies, print designs, ads and more. Another way to tell whether or not a video marketing firm is for you is by looking at their client partnerships. Exceptional video marketers invest in these relationships. They work collaboratively to create stunning designs and marketing campaigns that drive brand growth, increase brand awareness and boost conversions. Top video marketers have a process that is streamlined and efficient. They are an organized team of experts that know what they’re doing because they’ve done it all before. The best video marketing agencies across the world have a succinct process that helps drive them towards goals and results. This means that your brand can be confident in the work that they’ll do and the end results they’ll provide. When you enlist an outside agency, you know you’re going to have to spend money. More often than not, these services aren’t exactly cheap. Luckily, when you work with a top-performing video marketing firm, you can be sure that your return on investment (ROI)will be great. These top marketers work within your budget to create captivating video marketing campaigns. Plus, they provide ROI in the form of increased conversions, web traffic, brand awareness and sales. 1. What Platforms Support Video Content For Our Business Best & How Will You Promote Our Content? 83% of users get their video content directly from YouTube. Video production companies create videos, but video marketing companies also promote them to a variety of consumers across an array of platforms. Therefore, you need to ask how these marketing geniuses will create an entire campaign promoting your videos and uploading them to the web. There are a number of platforms great for video content — Youtube, Vimeo, social media, and beyond. Similarly, your own website, ads and other channels are possible promotional platforms. But not all forms of promotion are the same -- and not all will have the same impact on your brand and ultimate business goals. Make sure your video marketers understand your business and can plan accordingly. 2. How Will You Set, Meet And Track Goals? For any business to succeed, it has to set, track and meet goals. The same goes for the video marketing agency you partner with. Setting and tracking goals lead to more success down the line. In fact, you’re ten times more likely to reach goals if you write them down. You can’t just give them a task and let them run with it. You have to give them an end goal. There has to be a plan and something to work towards. The best video marketers will have a range of goals they are equipped to hit. They will even lay out some of those goals for you. But make sure your goals are very clear right from the start so these teams can create the campaign that blows those objectives out of the water. 3. Do You Have A Portfolio Of Experience Working With Similar Brands In The Past? The work an agency has done in the past is a great indicator of the work they can do in the future. Therefore, you have to look into this portfolio and ask specific questions. You want to see that they have experience adapting to new voices and brand identities. In addition, you need to know if they have experience with similar brands and your industry as a whole. This will demonstrate if they will be able to help your brand reach its personalized goals. 4. Who Will Be Working On Our Video Marketing Project? There are likely a dozen professionals — at least — that will be working on promoting and distributing these videos. Ask specific questions about their expertise and experience. Learn how the team functions as a whole, how it communicates and how it collaborates. You’re not just signing on the agency as an entity, but each individual that will have a hand in crafting the future of your brand. Take the time to investigate. 5. How Long Will The Video Production And Editing Process Take? Brands dabbling in videos all have different timelines for their projects. Therefore, it’s a waste of time to begin negotiations with an agency that is unable to meet your deadlines -- or invest in a video that is too complicated and won’t make it to market when you need it. Take the time to understand how quickly a potential video agency can work, how long each part of the process takes, and what types of videos offer fast turnarounds or require a long editing process. Asking the right questions from the beginning will ensure you aren’t blindsided by delays. Great video marketing agencies employ project managers as the key point of contact between client and agency. These managers keep the project on track and provide the communication necessary for both parties. In some cases, these product managers are also producers. Some companies may have an in-house producer that will work directly with the agency to provide top-level support. These individuals will also liaise with your team so that you’re constantly in the loop and confident that your project is going to plan. The best video marketing firms also employ digital strategies to come up with the entire campaign and strategy surrounding the video and its promotion. These professionals come up with the design and distribution concept. They even create overarching brand strategies to create a seamless and cohesive experience for your audiences. The storyboarders and copywriters on staff write the script and dictate the messaging of your video. These professionals are involved from pre-production to post-production. Your brand will need key messaging in order for its marketing campaigns to hit their mark. Therefore you need these dedicated storytellers to enlighten and inspire. Video marketing companies across the world wear many hats. They mainly distribute and promote video content. But they also have a hand in creating and tweaking videos for maximum impact. That’s where the videographers and editors come in. These professionals aid in the overall video creation, providing key insights that will help this video — whether it’s a commercial, a demo video, a how-to, an onboarding video or more — succeed. Graphic designers are also an essential part of the team. They create additional collateral including web design imagery, print designs, ads, social media imagery and more. This keeps branding consistent and creates a cohesive brand identity and marketing campaign that encourages viewers to go to your website and perform an action. Motion graphics bring video designs to life. These creative video elements help to tell a story and lead users on a journey. Therefore, it only makes sense that top video marketing teams have these players on staff. They create fluid and functioning digital designs that add a sophistication and clarity to your videos, making them more approachable by audiences. 43% of marketers say video is the most successful type of content for marketing purposes. The digital marketers on staff create the campaigns, content and relationships that bring these video designs to life. They are the ones creating email blasts, social media posts and more that promote your video to your audience. These digital marketers include social media marketers, content marketers, email marketers, paid media experts and more. Market research is an important step in the campaign and content creation process. After all, you can’t roll out a marketing plan and distribute content if you don’t know the audience, the brand and the overall competitive landscape. Luckily, top video marketing companies in the world include a process of effective market research that analyzes elements like audience demographics, competitor strategies, design trends and more. This helps them create a custom strategy that works for your brand. For instance, 70% of Youtube users watch videos for help solving problems. So working with a top video marketing firm can help you better understand what your audience wants, and it helps them deliver it. 51 percent of marketers prioritize creating visual content, such as video, in their content marketing strategy. In addition to the general video content work they do, these expert video marketing companies also offer complete branding and marketing support to craft a cohesive and sustainable identity. 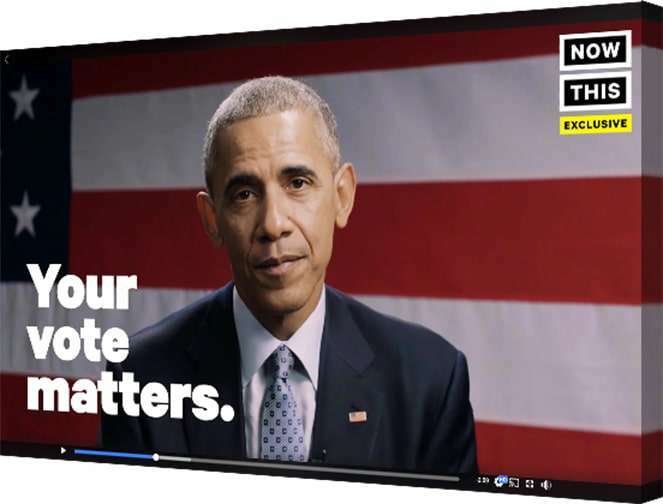 These professionals don’t just create one-off campaigns that get your video out there. They create all-encompassing plans that bring together all areas of digital and traditional marketing. They’ll include social media work, paid advertising, print ads and more into their campaign to bring your brand full circle. In addition to the essential marketing services provided by these expert video marketers, these video experts also know a thing or two about video production. Whether you’ve already created a dazzling video design or you’re in the process of editing, these companies have design and development expert on hand that can write, shoot, produce and edit your design, depending on platform and purpose. In addition to crafting award-winning strategies, these professional video marketers know how to stay on top of evolving trends and prepare for upcoming shifts in the market. These trends can be in the field of digital marketing — which has evolved more n the last two years than in the last 50. They also plan for changing design trends, making sure they infuse the latest technologies and features into your video to make it stand out. 62 percent of marketers cite video content marketing as a top marketing tactic. The best video marketing companies focus on goals. They establish credible paths to success and implement the necessary steps in order to get there. These goals include the ones set out by the agency itself, and you the client. Everyone has an end goal, and the team members should be aware of it throughout the process. This will ensure those goals are met with flying colors. The best video marketing companies will include costs for storyboarding and scripts if they’re involved with the video production process. These elements are what establish a video foundation and give it a base from which to grow. Without a storyboard and a script, your video will lack purpose. Therefore, it’s an essential factor in your budget. If your marketing company is creating your video, you’ll also see charges for production. Dedicated video editors will then comb through all of the content shot and created and piece it together into a consistent video that mirrors the storyboard. Video editors will also add in any necessary text, audio and effects, as needed. Depending on the type and length of video, editing can take 2 days to several weeks for a first draft. Unsurprisingly, different videos cost different amounts. For example, a quick, 15-second video for social won’t cost as much as a 30-second tv commercial. Therefore, depending on the type of video, its length and its size, you’ll see a different charge that correlates. It also depends on where and how you’re promoting your video. A short, local commercial spot can run you a couple hundred dollars, while a national spot costs upwards of $100,000. The last thing your brand will be charged with will be the overall promotion of the video. This includes the campaigns created to support it, its distribution and its promotion across a variety of platforms. 63% of marketers use video in their social media marketing campaigns. This will also include the campaign monitoring and analysis that top agencies will provide to let you know what the campaign achieved and how it reached your ultimate goals. Not all social media websites are created equal -- and the wrong social media video size can hinder your ability to pop up in people’s newsfeeds and scoring views. 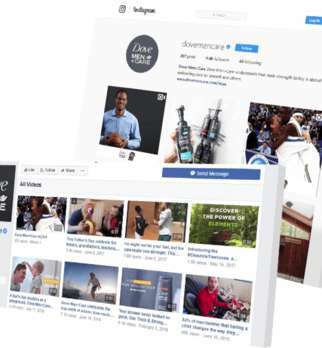 Dove Men’s Care keeps up with the changing video sizes on their different social media accounts well. Stay up-to-date with the latest sizes and guidelines to maximize your reach here. Just like size matters, the correct video length can make or break your impressions, too. Every social media network’s audience has a different use for the platform, so tailoring the length of your social media videos to their needs will pay off. Instagram and Twitter benefit from shorter videos -- aim for 30 seconds to one minute. However, Facebook and YouTube can handle longer content. Facebook has seen a big rise in long-form Facebook Live videos -- which live on your profile after the session. Meanwhile, YouTube SEO looks for high-value long-form content. Search engine optimization expert Brian Dean breaks down some easy tips to help you rank on YouTube, such as timely headlines and proper tagging, but the length of his own video says a lot, too -- at over 15 minutes, it demonstrates how various videos perform differently on certain social media platforms. Eighty-five percent of Facebook videos are watched without sound -- and it’s easy to see why. Most videos auto-play silently, and many viewers may be watching them at work or in areas that don’t warrant sound. Therefore, it’s important to place your reliance on visuals for social media videos -- especially on Facebook and Instagram. Now, this isn’t to say you can’t have sound -- but give your viewers something else to hold onto. NowThis News produces excellent silent videos on their Facebook page. 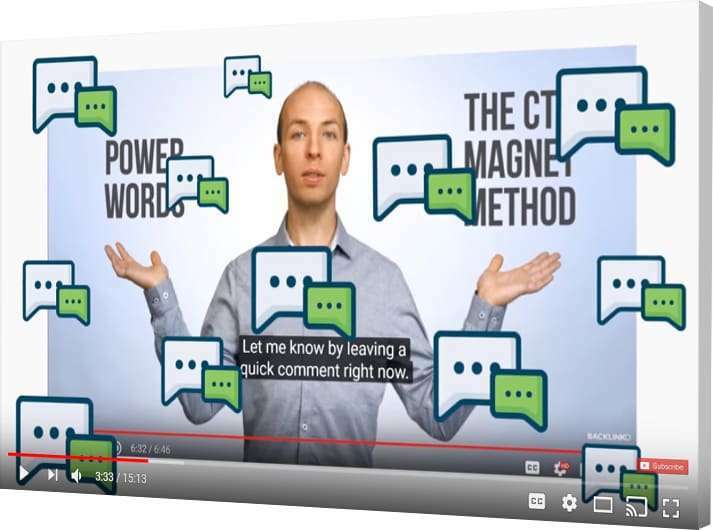 They overlay text captions on every video that has speaking or create videos with engaging b-roll that allows the text to simply tell the narrative. This makes it easy for viewers to consume and completely understand their content. Studies show that 98 percent of mobile phone users watch video vertically. Although this information may not change our run-of-the-mill video marketing, it certainly correlates with the rise of live feeds and real-time story updates on social media platforms. Networks such as Facebook, Instagram and Snapchat all have vertical video options that are worth exploring -- especially if you want to start dabbling in multimedia but are still on a lean startup budget. These raw, uncut updates have the potential to reach millions of viewers -- Instagram stories alone has over 250 million daily users. Plus, utilizing story features in particular help you beat the algorithms and boost your discoverability by other social media users. 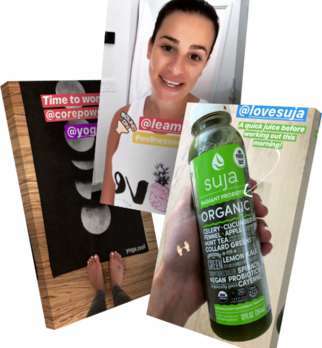 Wellness publication Well+Good often couples their Instagram stories with influencer marketing to capture an even wider audience. Recently, actress and singer Lea Michele “took over” their Instagram account and took viewers through a day in the life. According to ReelSEO, 82 percent of surveyed marketers found the video marketing improves their bottom line. So, investing in any type of video will be worthwhile. However, the type of videos that improve your SEO, reach high impressions, see high shares and speak to your audience may be different from what works for another brand. Don’t be afraid to create several different types of videos and see what performs the best. Or, make your strategy a little more official and A/B test your videos to determine the exact elements your audience identifies with. After trying many types of videos such as text-based and behind the scenes, Vogue finessed their video strategy to encompass mostly slightly scripted celebrity-based content. The quirky, high-fashion videos have garnered them 2.2 million followers. Video production and video marketing have exponential ROI potential for your business. More and more consumers are turning to video content to learn about businesses, understand products and engage with brands on the whole. Video marketers can drastically improve your bottom line, increasing brand awareness and boosting profits along the way. You just need to find the team that’s right for your brand. Explore the agency listings above to find the best video marketing company for your brand.